September means the start of a new school year, football season and college application season. The American College Application Campaign, in partnership with ACT’s Center for Equity in Learning, works to expand national efforts annually to assist even more high school seniors as they navigate the college admissions process. In fall 2017, more than 6,300 high schools hosted ACAC events resulting in more than 500,000 students submitting more than 835,000 college applications. We are excited that a new college application season is upon us and anticipate even more schools and students engaging this fall. To kick-off the college application season, ACAC is hosting #WhyApply Day on Friday, September 21. 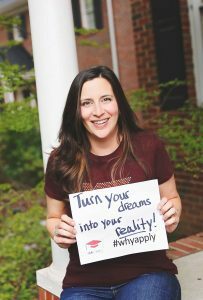 #WhyApply Day is a national effort to inspire and encourage students during this very important step on their journey to college. We want to encourage YOU to participate in the #WhyApply Day social media campaign. On this day, we are asking you to answer the question, “Why should students apply to college?” Your response can be about your experience or the experiences of those around you who have benefited from postsecondary education. To participate, share your reason for why students should apply to college using the hashtag #WhyApply. You can use this selfie printout which includes some suggestions for the types of #WhyApply posts to share on your favorite social media platforms. Be proud and wear your college gear, fly your college flags, and help us make the most out of #WhyApply Day! When you share your #WhyApply post, be sure to tag ACT CEL and ACAC. We’re all in this together as we build a college-going culture and can’t wait to see your #WhyApply posts!